While they might not be the absolute fastest cars on the track, I’ve always taken lots of enjoyment from seeing the various Honda builds that come out to compete at time attack events in the US. As usual, this year’s Super Lap Battle had plenty of Honda entrants, but there was one car in particular that stood out with its impressive speed and ultra-clean execution. 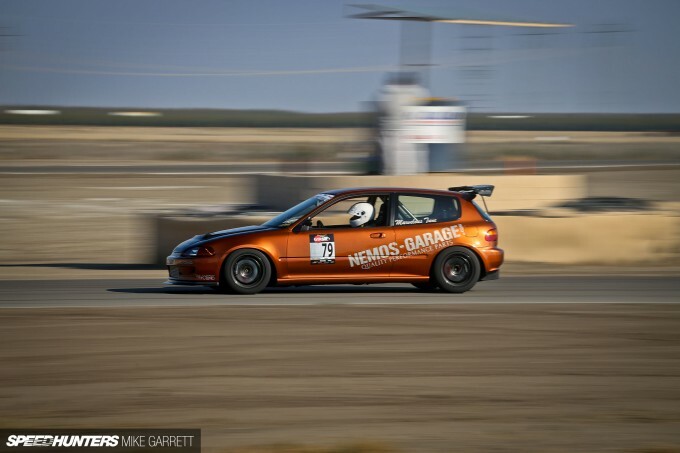 Say hello to the Nemo’s Garage EG Civic owned by Angel Torres. While many of the Hondas running in time attack are fully stripped-out, track-only machines, this ’93 Civic CX retains the vibe of a street build – license plates and all. It’s also finished with a show-car-like attention to detail. Handling the driving duties at Buttonwillow was none other than Mr. Yuta Akaishi. Yuta was actually planning on driving his fully rebuilt Civic sedan, but the car wasn’t quite ready for Super Lap Battle so he spent the day piloting the EG around the course. Under the hood sits a fully-built K20A fed by a MercRacing supercharger setup. While you used to find naturally aspirated B-series motors in most Hondas at the track, times have certainly changed. But it’s not just the engine setup that impresses – it’s the details throughout. 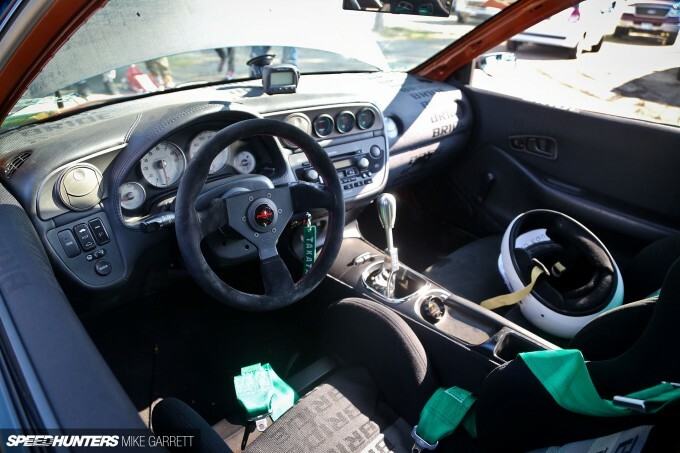 Check out the interior, featuring a full DC5 Acura RSX dashboard swap that looks amazingly at home inside the EG’s cabin. The wheels are 15×8-inch RAYS Volk Racing TE37SLs with sticky, but relatively narrow Bridgestone rubber. Behind the spokes you can see the Wilwood brakes that help to pull up the lightweight Honda. Aero is a big deal when it comes to time attack cars, but surprisingly the Civic keeps things pretty mild in this department with a subtle front spoiler, a rear diffuser and a lovely J’s Racing GT wing hanging over the back. And it all works too. At this week’s event Yuta drove the Civic to a best lap time of 1:56.5, which was good enough for second place in the Street FWD class. If you are looking for a recipe of how to build a great Honda in 2015, you might want to study up on this thing. Also, thanks for the content, Mike! Yuta's rebuilding his sedan currently, with the bodywork pretty much out of the way. Just waiting on his K-Swap and tuning session before he's back with that car. You can find that on The Chronicles as well. K20A with supercharcher , hp? VGlog 373HP/240LB-FT TQ (Bisimoto-tuned) before the new blower. I'm convinced as of late, supercharger is the way to go on my K24. Great build, sooo clean. I even like that orange. Excellent car, wish I could drive one! oneslyfox I'd go supercharged if I were you. I know a few people with supercharged K20/K24's and they're awesome. Really quick cars and the power curve is more linear compared to turbos. 375hp, weighs about at much as a sock, and it still got beaten?! Holy crap, what was 1st place like?! DC5 dashboard never seen that before, fits quite well. Make a few holes in the rear bumper and it may get first place. First place went to a 600hp B-series EM-1 with a bit more aero, bigger 17" TE-37's, bigger brakes etc... And to answer the other guy above putting holes in the back bumper isn't gonna give us 1st place lol!!! If I had a civic and the money, this is how I would do it. I love that dash swap, it looks amazing. Well done! That's quite an output for the other car, and depends if pockets are deep enough to try and compete, along with what you want to achieve I guess... I love the build, you guys have done a fantastic job, well done! RWD Yota Agreed. A big regret I had when I did my K20 swap (or rather, had my K20 swap done) 10 years ago was not getting the DC5R gauge cluster mounted as well. It sat in my sock drawer for years after I sold the car, scolding me for doing a half-a$$ed job of it. So I threw it out at the dump. The very next day someone offered me $250 for it. D'oh. 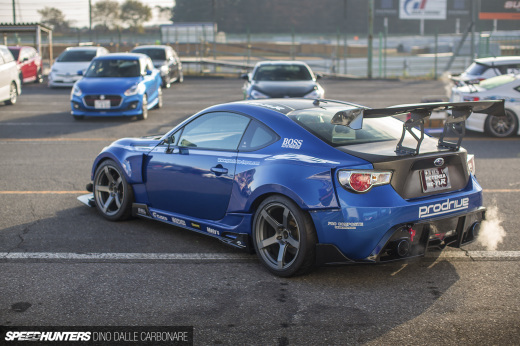 Is that a certain million mile Lexus in the background of the second pic? Thanks @jonathanW but in respect to the Nemo Garage build the focus is more on balance and building on the short comings of the car once certain aspects have been mastered i.e. ; upgrading wheel sizes once 15" wheels are no longer providing benefits etc. And @ rally2727 yeah that's what I was thinking when I was told by the other driver the output of his engine. Although I dont think that 600hp will be needed to achieve or surpass that time again. For instance the spoon civic beat the unlimited previous record with substantially less power than the previous record holder. Yeah I understand that, a well balanced car with thought out changes is how I like to do it too... With my s14 we're working on a carbon inlet feeding from the front bumper, along with fully ducted inter cooler and radiator, then moving on to some decent aero... we could throw a bigger turbo at it as it has the forged bottom end to support it, but for now we want to concentrate on chassis and aero... People will be far more impressed if we churn out quick lap times with only 300bhp instead of 450+, and of course we can always go that route in future. Best of luck with the project mate! Honda is like the Lego of the car world haha.. The most interchangeable car parts manufacturer, ever! I've always thought that those kind of superchargers go directly to the intake, but this one has an intercooler (I'm assuming it's an FMIC) would anyone care to explain how that works? TIA! meal stub cooler air temps always helps. Just on a turbocharger it is a must have because the air comming out of the turbo is so hot from he exhaust gasses heating the turbo itself. meal stub i guess the part that usually attaches to the intake is just connected with a air intake pipe connected with an ic. and the supercharger is attached to the engine with somekind of mounts. cant tell for sure but i thinks its like that. Its the same for most modern manufactures. You can put a 20V head of a 2004 GTI on a '89 GTI block. Or the Gatebil famous VW inline-5 TDI(!) blocks with Audi RS2 heads. RickardAngeria meal stub That's not completely accurate. Heat soak through the turbine housing is a small contributor to intake air temps. The main reason they get hot is because of a basic property of gas law, which says that as you increase pressure, temperature increases. That is where the majority of the charge air's temperature increase over ambient comes from. MadisSidam meal stub It took me a while to find pics that helped me understand what was going, here, but I think I figured it out. Many of the pics of Angel's car I found on line where of his old JR supercharged setup that was not intercooled. I couldn't find any good pics of this particular car's setup, but I found some pics showing the concept upon which the intake manifold of this car is built. Essentially, the way it works is that the supercharger works just like any other roots style blower. The secret is in the manifold. Whereas most commonly this style of blower mates directly to an intake manifold, and therefore shoves the air charge right out of the bottom of the blower and into the "plenum" of the manifold (sort of, the charger acts like the plenum), with this setup, the supercharger basically sits on a metal "box". The charge air is directed downward into this "box," and the bottom of the box merges into a funnel-like spout. This box is almost like a collector on an exhaust manifold. Then the air moves from the box, through its spout, and into a charge pipe that carries the charged air to an intercooler. Then the air moves from the intercooler, up an additional charge pipe, and into a special intake manifold that has no plenum, and is essentially the same idea as an exhaust header, only it flows in reverse, and the charged air goes from one pipe that then splits into 4 smaller tubes that lead to each intake opening on the head. All of this is built into one hybrid manifold/supercharger mount. It took me a while to wrap by brain around all of this.